When I was living in New York city, my dad and I would walk around the corner to the pizza place and always get the same order – two cheese pizzas and a baked ziti. Back then, a slice of pizza was just a $1, and then they’d wrap them up in a giant brown bag and we’d walk back home. I could barely eat half of a pizza then but I’d always stuff my face in the baked ziti. With cheesy, marinara baked pasta, how can any 6-year old resist? Now I’ve tried to recreate this amazing childhood ziti but as much as I loved the homemade version, it was just too much work for something I could easily buy at the local pizza parlor for $9.99. But with my recent one pot meal obsession, I’ve actually discovered a one pan baked ziti. 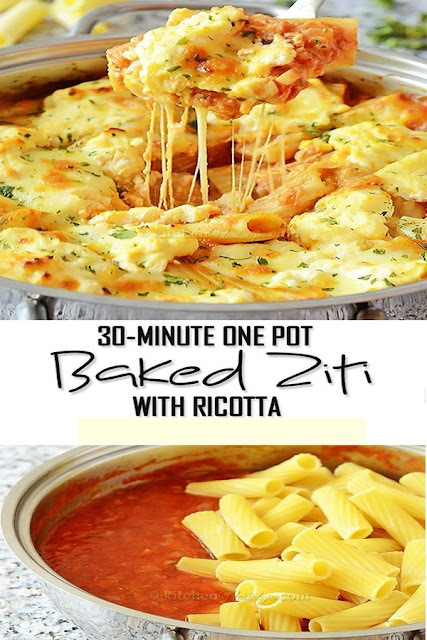 It’s unbelievably easy, and even the pasta gets cooked right in the pan! All you need to do is ground up some sausage, add in your tomatoes and pasta, and of course let that mozzarella just melt right in. Easy peasy, right? And if you really want to save up on some dishes, I recommend eating right out of the pan. Heat olive oil in a large skillet over medium high heat. Add Italian sausage and cook until browned, about 3-5 minutes, making sure to crumble the sausage as it cooks. Stir in garlic and red pepper flakes, and cook, stirring frequently, until fragrant, about 1 minute; season with salt and pepper, to taste. Stir in tomatoes and bring to a simmer until slightly thickened, about 8-10 minutes. Stir in pasta and 3 cups water. Bring to a boil; cover, reduce heat and simmer until pasta is cooked through, about 13-16 minutes. Remove from heat; stir in Parmesan and heavy cream. Top with mozzarella and cover until cheese has melted, about 2 minutes.